VJAA worked with the Walker Art Center to transform its green backyard into a new entry and cultural commons that celebrates the creative assets and collective knowledge that abounds in the Twin Cities. Initiated with a design community charette, the newly transformed courtyard is the site of Open Field, a multi-year experiment on participation and public space. Summertime events include Rock-the-Garden (a concert hosting 10,000 people), a series of large-scale art installations, classes and programs for all ages, and a neighborhood space with free WiFi access. The space provides the Walker with long-term site improvements in addition to new program areas. 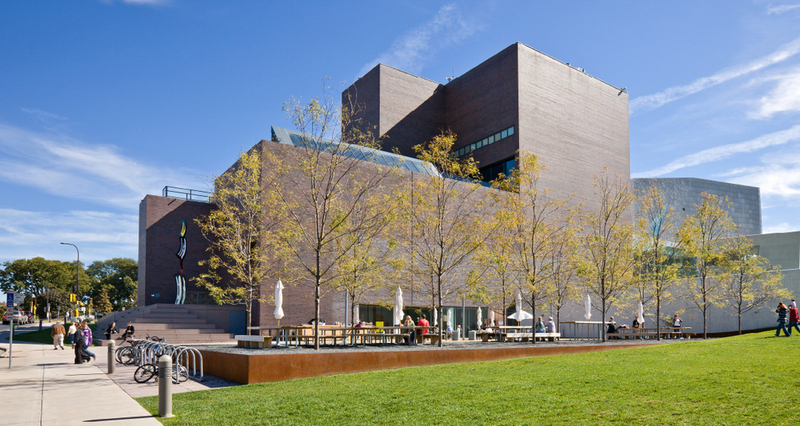 VJAA developed three components to organize the site, two of which were built in the first phase: a corten steel “raft” with trees and benches for informal gathering, classroom activities, evening films, and projected media; and an entry court, or “harbor”, for educational programming, a summertime grill, and wintertime ice bar. The project also incorporated remediation of the existing roof below, accommodation for emergency vehicles, and resolved existing site lighting and drainage issues.